On the cover is a 1933 map of Marshall Square Park, the oldest and most preserved of West Chester's ten public parks. It is comprised of 5 1/2 acres and is located in the northeastern section of town. The land, which includes the highest point in the borough, was originally acquired in 1841 as the site for the borough reservoir. The park was dedicated in 1848, making this year its 150th anniversary. It was named after Humphry Marshall (1722-1801), "one of the earliest and most distinguished horticulturists and botanists of our country" who "established the second botanic garden in this republic and also prepared and published the first treatise on the forest trees and shrubs of the United States. "* In 1878 Joshua Hoopes turned Marshall Square Park into an arboretum which contained a wide variety of species of trees and shrubs from all over the globe, a number of which remain today. The reservoir was replaced by a civil war monument in the 1880's and by the turn of the century the park also included a summer house, tool shed, fountains, and a zoo, making it a popular spot. In 1892-4, brick gutters, approximately 3 feet wide, were added as a drainage system. These "swales" ran along the gravel paths to protect them from storm erosion. The first to be laid was along the northeast entrance towards the fountain and at the southeast entrance, running into the street. The gutters of the southern portion were added in 1893, and the northwest were completed in 1894. 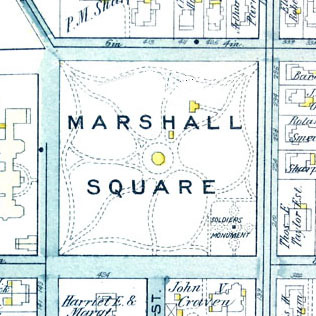 In 1988, a Marshall Square Park Master Plan was prepared to outline objectives for restoring the park. Virtually none of the Plan has been carried out due to budget problems. The Plan called for the brick swales to be uncovered, as they had been overgrown for decades. The project I chose for my Girl Scout Gold Award was to uncover the overgrown swales that were included in the Master Plan. Almost 1,000 feet of this project was already finished by Tim Beaugard, a boy Scout who was earning his Eagle award. With the help of volunteers, I unearthed the remaining swales. The total extent of the swale system is not known; however, the parts we both completed were estimated by the Plan to total 3,000 feet, and their restoration cost was an estimated $25,000 in 1988. Although it required a lot of hard work, I enjoyed doing this project. I have lived across the street from Marshall Square Park for twelve years and have had many chances to appreciate it. Uncovering the old brickwork has hopefully helped beautify the park, as well as aided in its historic preservation and will raise public awareness of its historic nature. I feel very grateful to the community for their support. While I was working, many people stopped to ask about my project, to comment on how wonderful it looked, and to thank me. It means a great deal to me that they appreciate the work that was done, and that I am able to earn this award. My grandmother earned the Girl Scout Golden Eaglet in 1935, and I would like to dedicate this project to her memory. *Quote taken from the original ordinance establishing the park. Other sources include: The Marshall Square Park Master Plan, "Marshall Square Park History" (a monograph by Jane E. Dorchester), Chester county Notebook by Paul A. Rodebaugh, and History of Chester County Pennsylvania, by Futhey and Cope.